At B9Creations, we know as you're considering investing in a 3D printer, it all comes down to one question: does it make financial sense for your business? That's why we've developed our Total Cost of Ownership comparison guide: to help you decide what 3D printer or method of production will best suit your business. After you input your business' weekly throughput, you'll choose a competitor to compare with the B9 Core Series - whether it's another 3D printer, a mill, or even outsourcing. After submission, B9Creations rep will deliver your the total cost of ownership, a personalized cost comparison which includes machine cost, material costs, consumables cost, and any other fees some competitor companies may charge, like service contracts. In addition to cost, our guide will also provide the maximum production capabilities of the B9 Core Series and the chosen competitor(s). It will also show how many printers you will need to meet your production - both today and to achieve your growth goals. Finally, we know that saving time is just as important as saving money and have included figures (based on your production) of exactly how much time a B9 Core Series printer will save you over the course of a year. 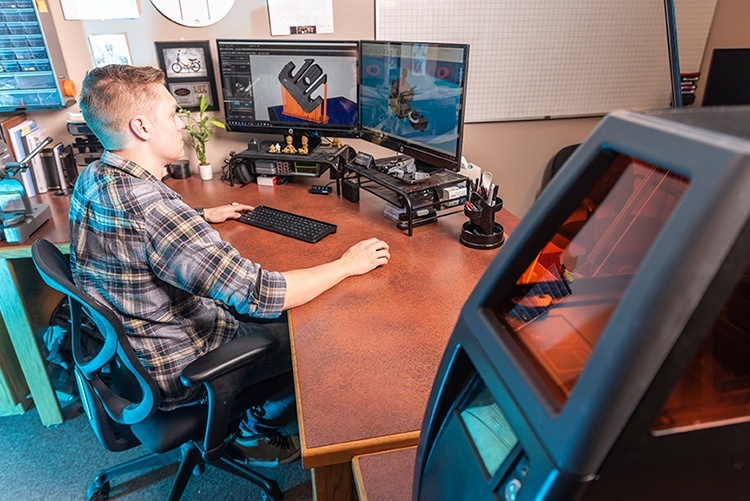 Schedule a time to get your personalized Total Cost of Ownership Comparison today to help you make the most informed decision on which 3D printer is right for you. Do they provide lifetime free tech support? How much are the materials? Are there other consumables; if so, how much do they cost? What are the maintenance needs of the machine, and how expensive are repairs? How much time does it take to print and post-process (clean and cure) a part? How will this 3D printer affect my production capabilities. Responsive Customer Service - B9Creations offers free lifetime, tech support and factory startup training. Time Savings - Imagine being able to bring a product to market in weeks instead of months, or being able to make a same-day sale with a customer? The B9 Core Series' superior speed will help you put your products in the hands of your customers faster. Better Results - Are you tired of waiting for your prototypes to be sent back? 3D printing allows for faster design iterations to perfect your product and bring it to market faster, all without sacrificing surface quality to speed. IP Protection - When you bring your production in house, you no longer need to worry about your intellectual property being stolen or shared when you send it off to print. Want to learn more about how a B9Creations 3D printer could fit into your business? Book time with an expert!